The black "giant" antagonist in "Game of Death" - Abdul Jabbar has a big name in United States. Everybody knows about him. The popular sports in the States are baseball, American football, basketball and ice hockey. In the basketball world, Jabbar is a big name. He is a professional player who is of great worth, just like Pele in the football world, and Ali in the boxing world. Every time he plays, he will attract a good crowd. He is a heroic figure. American show business likes to invite famous sports stars to show themselves on the screen. For they can make use of his fame to secure a good box record. For example, Spitz, who had won seven gold medals in the Olympic Games, was invited by a television station. Jabbar is so famous, of course, people will not let him go easily. But many of the proposals are refused by him. 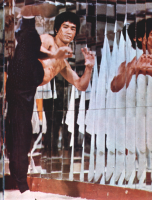 However, in the making of "Game of Death", Bruce was able to have his help. The credit should belong to Bruce. In the States, Bruce and Jabbar were good friends. 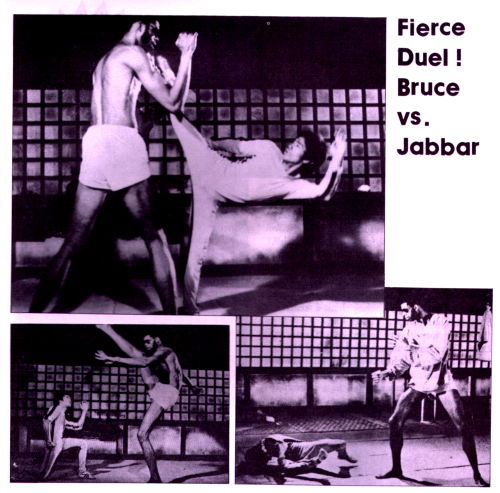 Jabbar respected Bruce. Bruce had taught him Jeetkune-do. In a sense, they had a teacher-disciple relationship. 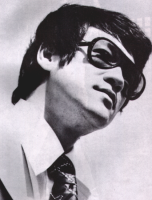 The important scene in "Game of Death" happened in a seven-storeyed tower. In that tower, each storey was guarded by a strong man. In entering the tower, Bruce had to defeat a strong man in a storey. In finding these seven men, Bruce had a great deal of difficulties. Later, Bruce went to the States. It was said that he had to settle some private matters. Actually he went to invite Jabbar to come to film in Hong Kong. 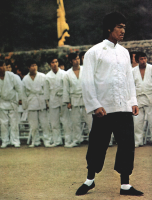 Bruce Lee's pretension - "Noble ladies"
Several months later, soon after "The Way of the Dragon" was finished, Golden Harvest suddenly had several guards at its entrance. Not only reporters were refused to enter, the staff in Golden Harvest Company had to get entrance by identity card. At that time, the reporters were very angry, thinking that Golden Harvest was too rude. The public relation department explained to the reporters by saying that Bruce was trying to find a female hero for his new film, and because many of the applications were noble ladies, it was not convenient to have their name and pictures printed on the newspapers, so they had to bear this inconvenience. On the notice-board, a note of "testing new actor" was posted too. Later, everybody knew that the so-called noble lady was a tall black man. Why did they have to keep this secret? It was known that there was a reason behind it. It was because Jabbar was a great star in basketball, his arms and legs were insured by the boss of his basketball club. 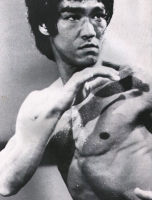 This time he asked for a leave to come to Hong Kong, on the reason that he was to do sightseeing and to see Bruce Lee. His boss did not know that he came to film, even in an action movie. If he had any harm, then the insurance company would have to pay a big sum. But if he could not play in a game, it would affect the income of the team. Thus, Golden Harvest and Bruce had to keep this as a top secret. If the news was disclosed, then the plan would be ruined by the insurance company and the team manager. Then the battle between the giant and Bruce would not be finished. The making of the scene took about a week. Everything just worked as planned. There was no accident. Then Raymond Chow and Bruce could put down a burden in their hearts. When the information and pictures were released, Jabbar had already flew back to the States. 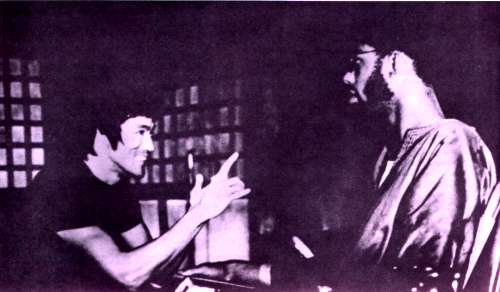 After finishing the scene, Bruce accompanied Jabbar to travel through Hong Kong. They had tried sea-food in Aberdeen. they took it as a gift to Jabbar. When jabbar left Hong Kong, he had too many pieces of luggage, Golden Harvest had to pay for the overload charges, too.